Centre proposes a ban on non-recyclable plastic. How prepared is India to implement it? Three-four soft drinks bought in paper cups with plastic tops, some biscuits in a plastic wrapper, a packet of chips for snack time and tetra-packed fruit juice to go with the meal. A person easily consumes this much in a day in Indian metropolises. But the plastic cups and wrappers take thousands of years to break down in a landfillthat is if they reach a landfill; most remain in the environment, clogging the soil and releasing polluting synthetic molecules. Not all plastic is recyclable. Metallized plastic used for packaging snacks, shampoo and tobacco comes with a layer of metal to make it look attractive and is non-recyclable. In September the Union environment ministry proposed a ban on manufacture and use of non-recyclable plastic that constitutes 40 per cent of the total plastic waste generated in India.It notified the draft rules for regulating plastic use in the country and invited comments from stakeholders. Once the final rules are notified they will replace the Recycled Plastics Manufacture and Usage rules of 1999 under the Environment Protection Act. 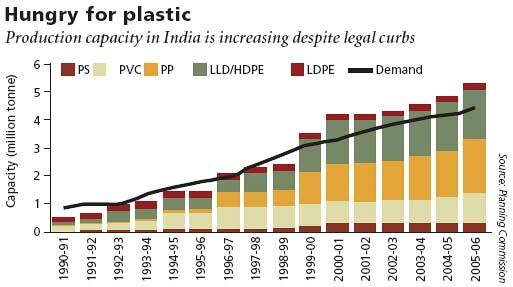 Revision of the 1999 rules became necessary because plastic production in India has increased three times since the rules came into force, according to official data. Several states have enforced stricter curbs on plastic. The ban will drastically affect the food processing industry since packaging accounts for 40 per cent of the plastic consumed in India, said O P Ratra, a consultant to the plastic industry (see Use of n on-recyclable plastic). Ratra was also a member of the National Plastic Waste Management Task Force set up by the environment ministry in 1996. The industry clearly does not like the proposal and is interpreting recyclable according to its convenience. It claims burning plastic in incinerators, cement kilns and blast furnaces and using it in making roads is recycling. The All India Plastic Industries Association has suggested to the ministry that plastic waste be burnt to create calorific energy. Burning plastic produces poisonous dioxins and heavy metals, and the use of plastic in incineration or waste-to-energy plants is not recyling because the end product is not plastic, said Bharati Chaturvedi, director of Chintan, an environmental research organization in Delhi. The government should stick to its commitments under the Stockholm Convention, which seeks to phase out dioxins, she added. Can biodegradable (compostable) plastic be an answer to non-recyclable plastic used in packaging food? The draft rules allow multi-layered packaging made of biodegradable plastic that meets the Bureau of Indian Standards specifications. Biodegradable plastic is a self-defeating proposition since India does not have enough composting facilities, pointed out the All India Plastic Industries Association. Even if it is used, without a proper waste disposal system biodegradable plastic will end up getting mixed with other plastic waste. 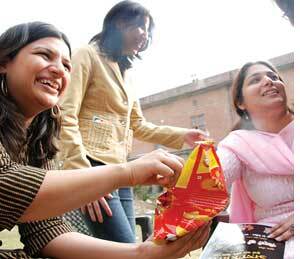 The draft rules have also increased the permissible thickness of plastic carry bags. They have proposed a ban on making and selling plastic carry bags less than 30x45 cm in size and less than 40 microns (a micron is a millionth of a metre) in thickness since smaller and thinner bags rarely reach recyclers. The minimum thickness specified in the 1999 rules was 20 microns. The new proposal will be difficult to implement because pollution control boards do not have the manpower and the machinery to monitor plastic thickness, said an official of the environment ministry. Another of the draft rules ambitious proposals is regularizing the unorganized recycling industry. The Central Pollution Control Board considers the unlicensed recycling units a health and environmental hazard since most of them are in residential areas and emit toxic gases. The draft rules have called for registration of all recyclers; till now they only had to get no-objection certificates from pollution control boards and other authorities. Industry association and civil society have criticized this, saying it will unnecessarily drag small recyclers into bureaucratic procedures. Units that have obtained no-objection certificates should not be burdened with fresh registration, the Indian Centre for Plastics in the Environment wrote to the ministry. If the policys concern is the environment it should not target the recycler but the primary producer. The law should ensure companies producing virgin plastic are accountable for recycling and collection of plastic, said Bharati. The Ranganath Misra committee set up by the Union environment ministry, which resulted in the amendment of the 1999 plastic rules in 2003, had also recommended that the plastic industry be made responsible for retrieval of discarded packaging material. It asked manufacturers to have a system in place to buy back plastic waste. Although trade representatives in the committee accepted the suggestion, it was not included in the amended rules. The government will need an army of people to implement the proposed rules, if notified, said Shyamala Mani, plastic expert with the Centre for Environment Education. The ban on using recycled plastic in the food and beverages packaging stipulated in the 1999 rules could not be implemented. Even today recycled plastic is used in pet water bottles, baby feeding bottles and medical products, she said. Recycled plastic may contain pesticides, fertilizers, lead or mercury from its previous use. Plastic experts point out that the revised rules do not ban all kinds of hazardous plastics. Styrofoam, commonly used for serving food and hot beverages, gives off highly carcinogenic styrene at 60C, which is the temperature of the beverage, said Shyamala Mani.